While fight fans were busy watching UFC 127 go down in the land down under this past Saturday, welterweight king Georges St-Pierre kept himself busy by dancing around the squared-circle with famed boxing trainer Freddie Roach. Although GSP unleashed a lightning-fast jab in his last outing against Josh Koscheck, which ultimately caused Kos’ right eye to look like THIS, the planet’s baddest 170-pounder isn’t about to rest on his success. 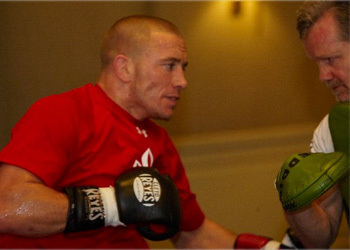 St-Pierre puts his title on the line against former Strikeforce and EliteXC champ Jake Shields at UFC 129 on April 30th. If GSP collects his ninth consecutive victory, he will then vacate the title and challenge Anderson Silva for his middleweight crown. On a side note – Koscheck told UFC president Dana White over the weekend he still felt numbness on the right side of his face. St-Pierre steamrolled him nearly three months ago.